What is Emre Can’s best position? One of the main criticisms aimed at Brendan Rodgers by the end of his Liverpool tenure was that he was playing his players out of position, but this was arguably one of his stronger traits. An ability to look at his players, pinpoint their best attributes and place them in the position for them to use said skills, showcasing his background in youth coaching. Instead, it was fitting the players together into a coherent whole that he struggled with. Take, for example, Lazar Markovic: the Serb arrived as a winger and occasional striker from Benfica and Rodgers moved him back into a wing-back role. From this deeper position, Markovic had space ahead of him to run into, capable of carrying the ball at pace on the counter. An opposing example could be Raheem Sterling, who the Northern Irishman did the same thing with. This gave Sterling space to run into like Markovic, but removed one of the best young attackers in the country from an attacking role. Whereas Markovic had a tendency to run in straight lines, Sterling had proven his footballing intelligence the previous season at the tip of a diamond midfield (another positional switch that had proved genius) and, with Luis Suarez gone and Daniel Sturridge out injured, his quality was desperately needed in the final third. So what of Emre Can? Rodgers had moved him from his natural midfield role back into the centre of defence, on the right side of a back three and he endured a decidely mixed time. The immediate bump in his form when Jurgen Klopp moved him back into his favoured midfield role made it clear he felt more comfortable there, yet the lack of growth since then might suggest that Rodgers had cottoned on to something. First things first, let’s make it clear: Emre Can is not a centre-back. Despite his height, he isn’t strong in the air and this was frequently exposed under Rodgers. This wasn’t so big an issue in a back three as he was generally having these aerial duels in fairly wide areas near the sides of the penalty box, but in a back four losing them would be much more dangerous as he would be more central. His time at centre-back did have a useful side-effect though: starting in the backline he could pick up the ball deep in his own half facing play and stride forward into space ahead of him. With little pressure on him in this first stage of build-up, he could make use of the powerful runs that are the arguably the best feature of his play as a box-to-box midfielder, forcing opposition teams into shifting shape to combat him safe in the knowledge that Lucas Leiva was dropping into the space he had left behind to cover. With Rodgers’ sacking this experiment was scrapped and since then we have seen perceptions of Can yo-yo. An initial bump in form on the arrival of Klopp was a welcome sign that he was in his right place for a fanbase that had grown tired of Rodgers’ methods. His reputation continued to grow in spite of some pretty glaring flaws and he then took a quite unfair battering for a dip in form that looked more to do with fatigue in a thin squad than a decline in his quality. His highs weren’t as high as they were presented, and his lows weren’t as low as the moans painted them. It’s easy to see why the perception of Can is muddled however, as there are two distinct sides to him from an attacking perspective. The first is the one we saw from him at centre-back: a willingness to push forward bravely on the ball, to get the opposition on their heels or be powered past, and an ability to pick a pass. The second is the one we are likely to see from him in centre-midfield: an infuriating tendency to always be in a position where he can’t pick the ball up off a defender and the turning circle of a boat. Facing play, Can is an unmistakable boon to the side and having him to pass the ball back to would be a relief for most forwards, but it’s getting the ball to those forwards that becomes the issue with him in the midfield. Ideally, the defenders and Jordan Henderson at the base of the midfield should be able to pass it forward into the midfield to supply the forwards, yet too often they end up either have to play longer passes direct to the forwards, which are easier to cut out, or wide to the full-backs. Can is rarely available for a pass for these deeper players and, even if he is, his difficulty on turning on the ball to be able to link with the forwards results in the ball being played back anyway. This might not be such an issue were he partnered with someone like Philippe Coutinho or Adam Lallana who can do this linking for him, however he is most frequently alongside Georginio Wijnaldum, who is more mobile on the ball but has the same positional difficulties. It might not be completely their fault, as Klopp likes to have them running beyond the wingers high up the pitch to overload the flanks, but this was a problem prior to the manager’s arrival and frankly they need to vary their movement more. This failure of both men to stagger their positioning up the pitch means that in addition to forcing the deeper players to go long, there’s no one in a position to counter-press if the pass is cut out, which is inclined to happen as Henderson is a good passer but by no means a playmaker. 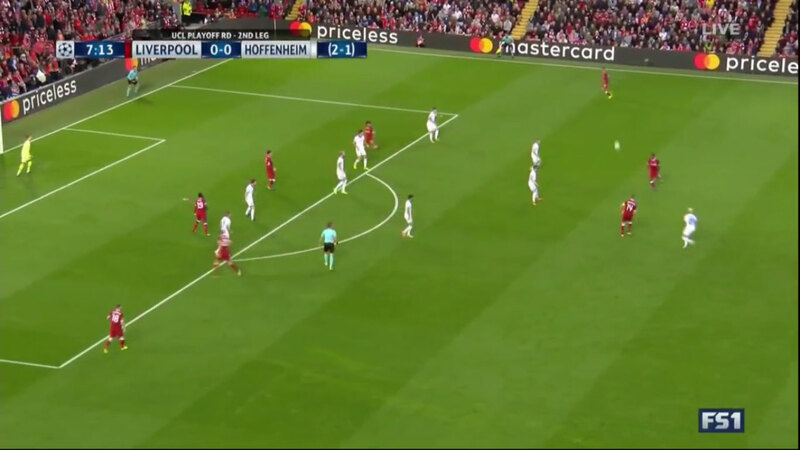 If the forwards all stay forward, the full-backs push up high and Can and Wijnaldum advance too, then that’s seven players very high ahead of the ball – excellent to overload the defence if the ball is won, suicidal if it’s lost. Henderson has adapted admirably to a deeper role, however he isn’t a natural holding midfielder and it can show – his running making up for a lot of the ground given away by his colleagues, but his determination to win the ball when it’s more appropriate to simply try to hold up a player and allow support to get back can open up Liverpool defensively – while it’s dubious as to whether or not Liverpool’s centre-backs are good enough even before you take into account how much they are exposed by so many players joining the attack. Then take into account that even if these three players were top quality, there’s a space from the edge of the area until the halfway line where only one midfielder would patrol, giving the opposition acres of space to control the ball, organise their counter-attack and break into. Although much of these issues are systemic rather than strictly an issue with Can, the German has a similar Jekyll and Hyde approach to defending as he does attacking. He is energetic in his pressing, generally does a good job of positioning himself so that he blocks passes into the feet of players behind him and, while it is possible to drag him up the pitch to leave space behind, this is symptomatic of Liverpool’s man-orientated pressing rather than solely a personal fault. That said, he doesn’t necessarily possess great defensive nous in regards to the team structure, instead focussing on simply what his job is. For instance, he may press and position himself so that it is difficult to play a pass around him, but if the opposition does break through the midfield line and he now needs to turn and around and support the defenders, he has a tendency to stop and stare when he should be rushing back. It’s not that he doesn’t track back, it’s that he frequently only tracks back if it is clearly his job to do so: chasing down an attacker to put in a tackle if they have run off the back of or past him, yet not sprinting back to support his teammates if the same happens to them. It’s also common for a teammate to shepherd a player towards Can but for him to just stand there rather than closing in on the player and cutting off their options. He essentially defends like a player in his own individual battle rather than as a part of an eleven playing another. In addition, although his energy and strength allow him to bully opposition players off the ball, his general lack of mobility means that players can dribble past him if they can shift his bodyweight in the right direction – his size making it harder for him to set his feet properly. So if Can isn’t a centre-back and he’s not necessarily a centre-midfielder either, what is he? One possible alternative is a full-back. He’s played the position before, debuting for Germany against Poland there, and starting wide means that he is already on the half-turn when receiving the ball, making it easier to get him facing forward to use his best skills. This made more sense under Rodgers, whose tendency to steal ideas from Pep Guardiola could have come in handy: Can playing as an inside full-back like the Catalan had used Philipp Lahm and David Alaba amongst others at Bayern Munich. Can could stay wide for the first stage of the build-up to make it easier for him to move the ball forward then tuck into the middle in his natural central role once the ball has progressed, again using his best attacking qualities with the play in front of him, while someone such as Jordan Ibe could provide the width on the right. There’s two major flaws with this idea though. One is that Rodgers isn’t manager anymore: Klopp uses his full-backs to provide width and, while Can can run, the expectation on Liverpool’s full-backs is a level beyond what he can muster. The second is that he already struggles with some of the technical aspects of defending in midfield, so putting him up against tricky wingers isn’t likely to end well, especially in a league with such a heavy emphasis on wide players as the Premier League. There’s also the issue of whether some of Can’s qualities would be the same from a wide position – he can burst past a player and is a good passer, but how does that translate to beating his opposing full-back and whipping in a cross? We simply don’t know currently. Can considers the holding role to be his strongest: “I’ve had calf problems for many years and it has been very difficult for me because I’ve played out of position, which means more sprints… When I play as a number eight I have to go forward and sprint more and I had a few problems with my calf. When I play at six you don’t have to sprint too much, you are in the middle and you have to make challenges and don’t have to go too far away.” The issue with this is that those sprints are arguably his best attribute and, while he has shown himself to be calmer in this role when given the opportunity, he needs greater awareness of his surroundings to be successful there. Him being the first pass out of defence also only highlights his issues with his back to goal further – unless he drops in between the centre-backs, although this then makes Liverpool’s build-up more one dimensional. The reality is that the box-to-box role he currently plays probably is his best position, but his deficiencies mean he can’t always be relied upon to play to the standard Liverpool require. Nevertheless, there are some methods Liverpool could employ to get around these flaws yet still let him play in the centre of the park: RB Leipzig often have one of their midfielders drop back to the right of their centre-backs, allowing the right-back to push on and the centre-midfielder to join the first stage of the build-up, which could suit both Can and Nathaniel Clyne, but also afford Henderson greater freedom. It’s of course not too much to expect a professional footballer to work on their weaknesses, however Liverpool don’t currently offer real support to make that happen. If Can had a guiding influence like Steven Gerrard had Gary McAllister or a calm head like Dietmar Hamann alongside him, he would be likely to blossom into a world-class midfielder, yet he is surrounded by players who have problems of their own and can’t be expected to walk him through a game. With Can in the last year of his contract, there’s some panic around his future. On current ability Can probably wouldn’t be much of a loss to Liverpool – still, it’s not difficult to imagine him walking into another team and fulfilling his considerable potential. It’s this question of what could have been which makes him an important figure, but also a frustrating reflection of where Liverpool presently are. Georginio Wijnaldum: Liverpool’s New Unsung Hero?